Below are books that the Historic Bridge Foundation recommends for interested readers. By Nathan Holth, author of HistoricBridges.org, Chicago’s Bridges provides a discussion of the history of Chicago’s movable bridges, and includes a virtual tour discussing all movable bridges remaining in Chicago today. The book includes dozens of full color photos. Available Now Direct From The Publisher! 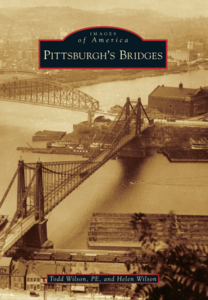 By Todd Wilson, PE and Helen Wilson, Pittsburgh’s Bridges takes a comprehensive look at the design, construction, and, sometimes, demolition of the bridges that shaped Pittsburgh, ranging from the covered bridges of yesterday to those that define the skyline today. 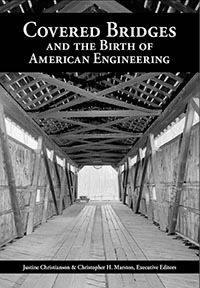 Edited by HAER Historian Justine Christianson and HAER Architect Christopher H. Marston, Covered Bridges and the Birth of American Engineering examines the development of wood trusses and covered bridge construction, profiles the pioneering craftsmen and engineers involved, explores the function of trusses in covered bridges, and looks at the preservation and future of these distinctly American bridges. Digital Copy Available From The National Parks Service!